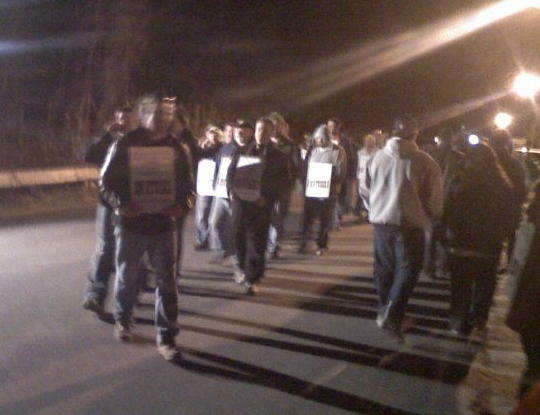 Workers at the Shaw’s and Star Markets supermarket chains went on strike March 8. There are Shaw’s stores in Keene and near Brattleboro in Wilmington, Vermont. Members of United Food and Commercial Workers Local 791 voted 288 to 8 to strike. The workers asked people to boycott Shaw’s until the strike is over. 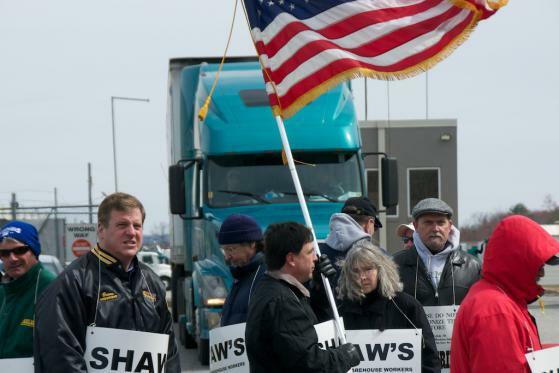 The striking workers distribute perishable food like fruit, vegetables, milk, and meat to Shaw's and Star Markets stores throughout New England. C&S Wholesale Grocers is based in Keene. It is the biggest food wholesaler in the U.S., he said. On March 29, members of the Vermont chapter of Jobs With Justice www.workerscenter.org picketed the C&S warehouse in Brattleboro. Organizer Jake Williams said JWJ members will hand out fliers to shoppers at the Shaw's store in Keene on April 3 starting at 10 a.m. The public is welcome to help. 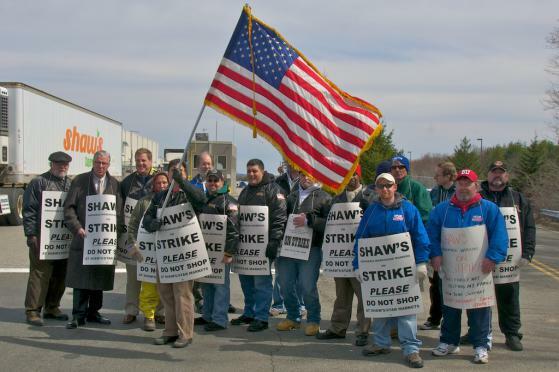 More information is available at www.JusticeAtShaws.org (where you can watch an excellent video about the strike) and www.ufcw791.org and by going to www.facebook.com and logging in (or creating a free account) then searching the Facebook site for "We support the Shaws Methuen Distribution Center." The Facebook page has frequent updates written by the striking workers. This photo is of Shaw's workers on March 7. Submitted by Anonymous on Thu, 04/01/2010 - 10:09. It sounds like a common problem. Health insurance costs are skyrocketing and squeezing employers. The employers then pass those increases along to workers. It speaks volumes to the need for a single payer national health care plan that isn't associated with employment. Not only is the current approach overly expensive, but it penalizes employers and employees. What is Shaw's doing to address their health care costs, other than reducing benefits and passing higher costs along to workers? Are they aggressively advocating a better system at the state and federal levels? We hear the heath care debate phrased in terms of "a human right," but it's also an economic anchor weighing our economy down. There is room here for businesses to join with their workers to advance a better system. Is Shaw's involved in this effort?